ATLANTA – Atlanta based firm has joined forces with Gardener-Mathews to swim in international waters. Gardener-Mathews is a luxury, travel/concierge based in Atlanta, with a very wide client base in Asia. Gardener-Mathews was acquired through Atlanta PR firm, Campbell Manning, LLC. This client was seeking a look that appealed to corporate America and its international clientele. “We wanted to stick with the professional look our client had initially set forth. We chose color blocking because it helps to better guide the viewer to the page content. Black is a very commanding color and we decided it was best to use in highlighting the company’s industry superiority.” said Joey Q. Shephard, Chief Creative Director. With Gardner-Mathews, they created a direct mail brochure, and a website that engaged the viewer from the moment they viewed each piece. Through carefully constructed pieces, they were able to flawlessly create a design piece that branded the company in the eyes of its viewer. To date, Gardner-Mathews has garnered a large number of clients in the US, as well as in its biggest market, Asia. The marketing pieces created have been effective in being appealing to a local, and international audience. The Gardner-Mathews website has also increased viewership by 200%. They look forward to their growing popularity inside, and outside the states. 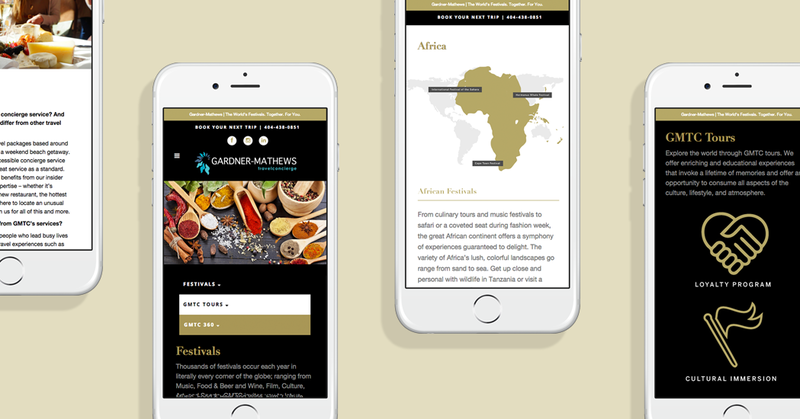 About Gardner-Mathews Travel Concierge – Gardner-Mathews Travel Concierge (GMTC) is the go-to partner for discerning travelers in search of unique, authentic global experiences. We specialize in managing your every travel need for international festivals– from sourcing the perfect hotel and creating a tailor-made itinerary, to advising on local culture with tips to enhance your overall stay. About QJS Design Studio – Founded in 2011, QJS is a full service creative agency forging brands with effective, customized strategies that work. We blend proven business strategy, innovative technology, and creative solutions to strengthen brands, grow e-commerce, deliver ROI, and enhance visibility across various mediums.